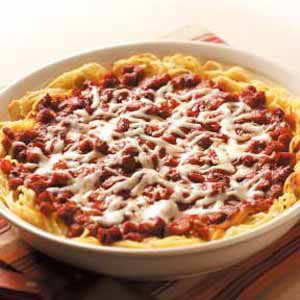 If your family likes spaghetti, try this spaghetti “pie.” All the great taste of spaghetti with a twist! Grease an 8 X 8 square glass pan or 10″ deep-dish pie plate. Preheat oven to 350 degrees. Cook pasta in boiling salted water. Drain and place in large bowl. You should have about 2 and ½ c noodles. Stir in butter, eggs and parmesan cheese. Press pasta mixture in prepared pan/pie plate. Remove sausage from link casing. In a large saucepan, crumble sausage and cook with onion, bell pepper if using, until veggies are tender and meat is brown. Drain off fat. Stir in tomatoes, tomato paste, sugar, oregano, and garlic salt. Heat through – about 5 minutes. Spread cottage cheese over bottom of pasta crust. Spoon meat mixture over pie. Bake uncovered for 20 minutes. Sprinkle mozzarella cheese over top and bake 5 minutes more or until cheese is melted.